One was a veteran police officer who didn't hesitate to run toward danger. Another had survived the deadliest mass shooting in modern U.S. history. 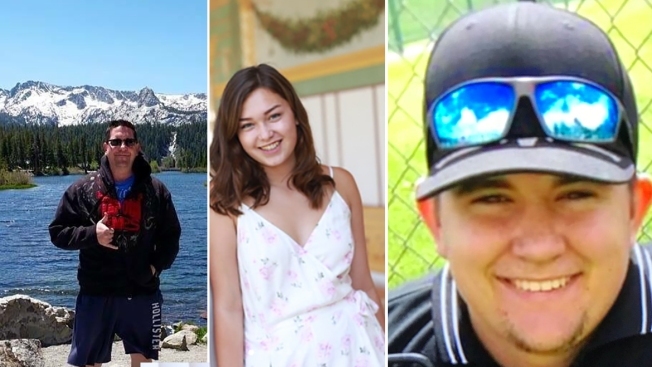 Others include two friends who loved off-roading, a Marine veteran who dedicated his life to service and a recent college graduate who worked with children with special needs. Cody adored his siblings -- three brothers between ages 6 and 9 -- and he couldn't wait for the birth of a sister, due on Nov. 29, his father said. She played soccer and tennis all through high school, studied piano and violin, and sang, he said. "She's a really good kid," he said, fighting tears. "Everybody loves her." It was the last time she would talk to her husband. Helus rushed toward the shooting and immediately exchanged fire with the gunman, Dean said. Helus was hit multiple times. Dean choked back tears talking about Helus and called him a hero. "He went in there to save people and paid the ultimate price," he said. Meek worked at the bar with his sister and fellow Cal Lutheran student, Victoria Rose Meek, who survived, Ellis said. Meek played water polo for Cal Lutheran. He also lent his full, velvety voice to the school choir, where "every time he sang, you could just feel it in your soul," recalled choir member Rachel Counihan, 20. The married father of two boys died doing what he was passionate about -- protecting people, Allen said. "He was a very, very big personality and had a very, very gorgeous smile," she said, adding that he had once considered becoming a police officer. His other passion, she said, was coffee. Adler recently opened his own coffee shop, Rivalry Roasters, in Simi Valley, said Phil Englander, another longtime friend. Daniel Manrique, 33, dedicated his life to service -- as a hospital volunteer, U.S. Marine and manager of an organization that helps veterans adjust after leaving the military. He was a radio operator with the 2nd Combat Engineer Battalion, 2nd Marine Division based at Camp Lejeune, North Carolina, and he deployed to Afghanistan in 2007 with the 26th Marine Expeditionary Unit. "The best way I can describe him is as a saint. He truly believed in service," friend and business partner Tim O'Brien said. "Dan was the guy you could rely on if you ran out of gas in the middle of the night. He would help you out if something bad happened. He was there, dedicated, loyal." The two high school friends were preparing to open a veteran-oriented brewery called "O'brique" -- a combination of their last names. Manrique also volunteered at a hospital helping the homeless and at a local church. Her aunt Patricia Sparks of Morristown, Tennessee, told The Associated Press that the family was "in shock." She described her niece as an "all-around good girl. She was the kind of girl that if you had friends, you'd want them to marry her." Sparks, who was majoring in art at nearby Moorpark College, often went to Borderline with friends and her mom, going there for Halloween and her 21st birthday in August. When friend Jackie Jones heard about the shooting, she jumped into her car and headed to the bar, determined to find Sparks. Kristina Morisette worked at the front desk of Borderline and had just bought her first car -- a 2017 Jeep Renegade -- with the money she had saved, her father said. Michael Morisette said that his energetic and talkative 20-year-old daughter had just returned from a trip to Austin, Texas, and he hugged her, relieved she was back home safe in Simi Valley. "We'd rather just curl up in a ball and turn off the lights, but there are other people out there that are hurting, too," Michael Morisette told the newspaper as he held his wife's hand. "We could either retreat and draw our curtains, or we could talk about the beauty of the things that were." He said Kristina, the youngest of three children, was a thoughtful friend who always helped others. She enjoyed hiking and drawing and was considering applying for an animal training program in Austin. "We didn't want her life to end, but we don't want her memories now to end, either," mother Martha Morisette said. "We'll probably always have a hard time dealing with it." Blake Dingman was passionate about working on cars and motorcycles, challenging himself to make repairs on anything mechanical even if he wasn't exactly sure how to do it, mother Lorrie Dingman said. The 21-year-old always had a smile on his face and grease under his fingernails, she said. Blake was working in the electrical field and was excited about getting a new job, his mother said. She said he was confident, talented, caring and had a huge heart. On Instagram, brother Aidan Dingman wrote that "my amazing brother was taken down by the shooter" and that his life has been forever changed. "He always tried to convince people to (let him) drive their car. Everyone knew it was a bad idea, but sometimes they'd do it," Michael Moses said. Meza grew up in the Santa Barbara area and had worked in the service industry since he was a teen. He was one of the few teenagers who got hired at Sandpiper Lodge in Santa Barbara, manager Shawn Boteju said. Meza worked full time at the Sandpiper in housekeeping and would come to work on a hoverboard.